This is happening for “pages” 18, 15, 17, 20, 2, 5. I posted a screenshot of the crawl errors. Otherwise, the new page is working great–my bounce rate dropped from 85% to 15% and time on my website increased. This topic was modified 1 year, 8 months ago by MJ. I am pretty sure this has nothing to do with Elementor. If you see those messages in Google Search console, that is probably caused by earlier change of page names or even deleting pages. As they where indexed prior to your deletion or change of name, Google still looks for them but can no longer find them and tells you that by these errors. First of all, if I visit https://soccermoviemom.com/page/18 I do not get an error and can see the page just fine. I suppose this https://soccermoviemom.com/page/18 was first published as https://soccermoviemom.com/18. If you completely remove the old page https://soccermoviemom.com/18 ( check your trach too, if its still there its still on your domain ) google will stop looking for that page at some point. If you want to speed this up, go to Google index – url removal. This way the search for these no longer exesting pages will stop. Oh, and some good SEO advice! Go to wordpress settings – permalinks and set your pages to nice, clean seo friendly names ( no numbers etc ) and save them. Thx for taking the time to contribute your ideas. However, The issue is that I have NOT created these URLs of smm/18 and smm/page/18. They were created by Elementor. I suspect these errant URLs are occurring because I deleted some sections in elenentor, and elementor did not clean them up properly. I actually do try to keep urls short, but the long urls u mention are ones from when I first started, or are due to how WordPress handles nesting of pages. Your suggestion to look for the errant files in the file structure is a possibility, but I wouldn’t be surprised if those are virtual files. However, I will check. This reply was modified 1 year, 8 months ago by MJ. Really? I am not new to wordpress and/or pagebuilder, however fairly new to elementor so I might be missing something here. If I create a section with elementor, I do not see page urls being created by each section. I would be flabbergasted actually, if it did….How and where should I see that? What exactly makes you think that creating a section in Elementor, actually creates a page too? A section is just a block within a page, not a new page right? The urls you mention do refer to pages created by WordPress if or before the time you set the permalinks. By default wordpress does create pages with numbers etc. So if there where pages created before you started using the nice url permalinks structure, that might be those now no longer found pages? Also, when I go straigt to: https://soccermoviemom.com/ I suppose that is your homepage? However, if I click on “all” I go to yet another kind of homepage: https://soccermoviemom.com/home-page/ which might be confusing? I know this is getting way out of topic ( sorry about that ) just stumbled upon by visiting your site and trying to figure out your problem. :-). By the way, I can tell by looking at your source code, that you are using the tablepress plugin. If I am not mistaken, that creates some sort of virtual pages, then lets you insert the created content by adding a short code to a post or page right? ( I don not use it myself ). Clould it be some left over from this plugin? Hi @prmyapps, if you use SEO by Yoast, see if it places the Elementor library in the sitemap. If this is the case disable this function in SEO by Yoast. Good point! I am still test driving elementor, but checked Yoast SEO settings, and by default it does index the “elementor_library” so thats something to keep in mind, thanks! Do you think this might be the kind of pages MJ is seeing? I do not use SEO by Yoast. I use Tablepress, which has its own shortcodes, but I do not have any tablepress tables in my Elementor front page. i haven’t had a chance to look at the server files to see if there is a real file referencing the non-existant link. I just woke up! > using the nice url permalinks structure, that might be those now no longer found pages? Yes, soccermoviemom.com goes to my new Elementor Front Page. want to redirect the URL and so I did not rename the page but kept its filename as homepage. i looked at the file system, and i realized that none of those URL filenames are there because they are all generated virtually out of the WP database. So the database would be the place to look, but I don’t know how to access nor browse it. 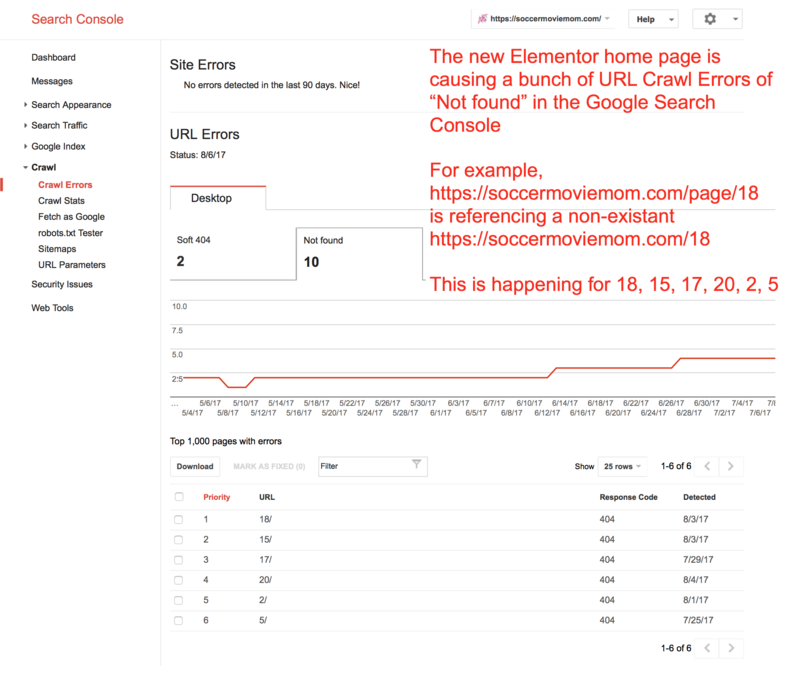 I am positive these “not found” URL links are coming from ELementor because the Google crawl errors only showed up AFTER I implemented my Elementor front page. If they were from WP pages numbered 18, 15, 17, 20, 2, and 5, and if WP names its pages sequentially, these crawl errors should have started when I first created the website. I started my front page by using an ELementor template. I then modified or deleted the sections they had created. I think I deleted 5-6 sections, which would correspond with the number of missing URLs. This is a permalink issue. Please read up on how WordPress permalinks work. I almost always exclusively use “post name” structure. Once your permalinks are adjusted the way you want them you’ll need to wait until your site is re-indexed and until then, you’ll have broken links, nothing you can do except redirect them and/or wait. You can use a redirection plugin to re-create those broken links and redirect them to the proper url structure until the site is properly re-indexed. The suggestion to use the Yoast SEO plugin was so you could specifically apply “no follow, no index” rules to the elementor-template custom post type since this is a special post type not to be seen on the front end of your site. This is not a post. It is a wordpress Front Page and is my home page. I don’t think it makes sense to put “no follow, no index” on my home page. Yes I could redirect these broken links, but it seems to me that if Elementor is creating the bad links, then they should correct the problem, rather than have their users end up with crawl errors. I was hoping that by posting this problem, Elementor would either fix it or give me a better workaround than redirecting their bad links. I understand you think this is an Elementor issue, but I am convinced it is not. If Philip talks about a “custom post type” he is not referring to an actual default blog post, but a “custom post type”. An Elementor template is a custom post type. He is not advising you to set a no index to your actual homepage, only to the custom post type. If these pages do no longer excist, they will no langer get indexed anyway after a while. There is something off with your permalinks structure. This will confuse wordpress, because a blog post suddenly is treated like a page ( the category base is gone if one goes to the actual blog post. I do think it would be best to dive into permalinks structure and best seo practices. Another great read that may give you some clues as to how to solve this and fully control your url structure. Also, an issue I often see is not cache-busting after making changes. This has happened to me more times than I’d care to admit but sometimes you just plain forget or don’t even know how many caching layers there are and each need to be flushed after making changes to your content and site map structure. For example, sometimes your host or Cloudflare-like service may hold on to old files, url structures or even an old site-map that is getting indexed. you guys are well-meaning, but everything you are suggesting is specific to Yoast, which I do not use. I researched what is a wordpress custom post type, and now I understand what you are talking about. In Yoast, you have a setting for “noindex, follow” for your post templates. But there is no such setting for Elementor templates. Plus, I could find no Elementor documentation specifying a need for such a setting for its page templates. Secondly, I use the “Post name” setting for Permalinks, but I edit the URL so that it is short. Here is how Fetch as Google sees my website posts. I hope you will agree they already adhere to the guidelines mentioned by the article links you sent me. Lastly, notice that the above is a flat naming structure. I do NOT put postnames under a category structure because my posts can be filed under MULTIPLE categories, as well as multiple tags. Thank you again for your help, I am giving up on solving this problem. The topic ‘Elementor creates google crawl errors’ is closed to new replies.